Like all of WWP’s programs and services, the event at REI was an opportunity for warriors to connect with one another. WASHINGTON (April 17, 2017) – Backpacking in the wilderness and maintaining your bicycle are activities that require a certain level of preparation and technique. That’s why Wounded Warrior Project® (WWP) recently teamed up with outdoor retailer REI to host an afternoon class on how master these activities. Like many others at the event, Army veteran Stephanie Hornedo was a newcomer to backpacking. 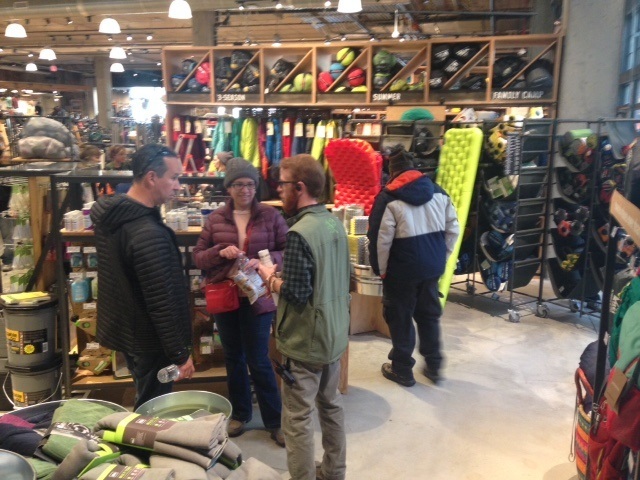 REI staff taught the group the basics of how to select the best backpacking equipment for height, weight, and distance being traveled. During the REI gathering, warriors also learned bicycle maintenance skills. “The most helpful tip of the class for me was learning how to change a flat tire,” Stephanie said. WWP’s programs not only equip warriors with knowledge and skills to live a healthy and active lifestyle, but they also support warriors as they manage their mental health through physical activity and connecting with other veterans. In a WWP survey of the injured warriors it serves, 29.6 percent of survey respondents expressed physical activity helps them cope with stress and emotional concerns. Like all of WWP’s programs and services, the event at REI was an opportunity for warriors to connect with one another. Stephanie reflected that while she walked out with new knowledge for her outdoor adventures, the best part of her day was inside the classroom with her fellow veterans. Thanks to generous donors, WWP programs and services are offered free of charge to warriors, their caregivers, and families, and they assist with mental health, physical health and wellness, career and benefits counseling, connecting warriors with one another and their communities, and long-term care for the most seriously wounded.